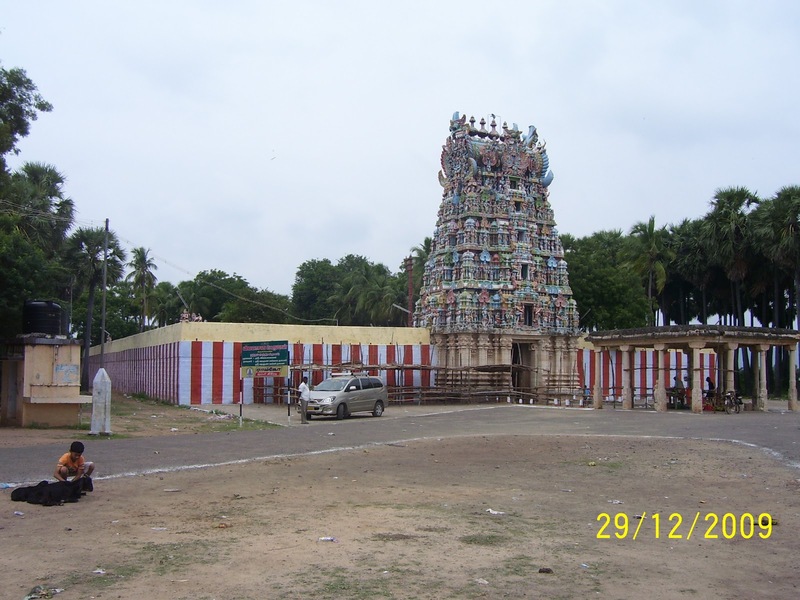 The place ‘Thiru varagunamangai’, where the second temple of the Nava Tirupathi group is situated, is popularly known as ‘Natham’. It is a very small place, about three kilometres away from Srivaikuntam, as we continue our journey on the Tirunelveli-Tiruchendur road. The temple too is a comparatively small one with a small but impressive gopuram at the entrance. Devaprasnam revealing that there existed a temple tank closeby, the upper layer of earth, which had covered it, was removed, the hidden tank found out and renovated later. The Kumbabishekam of this temple was last performed in October, 1996. About the origin of this temple, the story goes thus. A poor brahmin by name Vedavith, who lived in Punyagosham Agraharam on the bank of river Rewa, after discharging all the legitimate duties expected of him to his mother, father and guru, wanted to do penance for getting the darshan of Thirumal ( Maha Vishnu). The Lord, who knew this, took the form of an old brahmin, came to Vedavith’s place and told him that ‘Varagunamangai’ ( the present Natham village) was the spot ideally suitaed for his penance. Vedavith followed his advice meticulously. He went to the spot, performed deep penance chanting Asana mantra, got the darshan of Maha Vishnu and also attained Moksha. As the Lord appeared before Vedavith in response to his penance (chanting the particular mantra), Maha Vishnu came to be known as Vijayasanar here. It is at this place the Lord is supposed to have given darshan to Romesha Maharishi, Savithri, the staunch pathivratha, who fought with Yama and got back her husband Sathyavan’s life and Agni deva. Adhi Seshan, the serpent god, under the name of Satyanarayana provides protection to the lord’s head as an umbrella. It is said that anyone who dies at this place attains Moksha. The Lord Vijayasanar is in sitting pose here, facing east. His consorts Varagunavalli Thayar and Varagunamangai Thayar are with him.